Photo courtesy Uptown Dallas, Inc.
Travel along Cedar Springs Road on your morning commute? Uptown Dallas, Inc. crossed major construction and landscape installation along Cedar Springs Road off its project list. Soon you’ll be able to stop and smell the flowers. 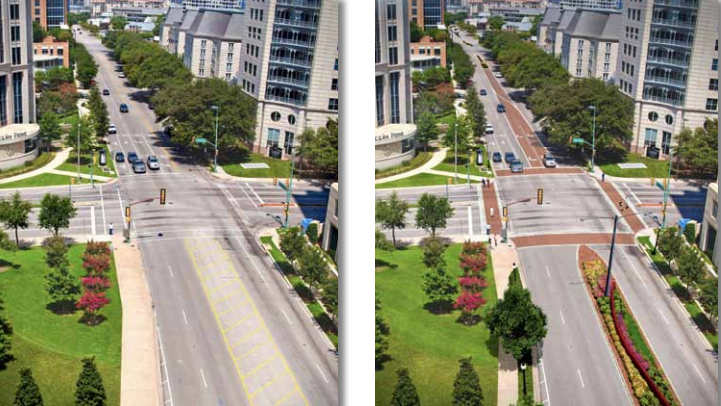 Uptown Dallas is now focused on planting bright, seasonal color beds in designated areas on March 15 as part of the streetscape makeover plan. With a rise in both foot and vehicular traffic, signals and pedestrian countdown meters have been established at the intersection of Cedar Springs and Carlisle Street. Drivers, take note, the lanes also narrow in the name of pedestrian safety. Both Cedar Springs intersections at Routh Avenue and Maple Avenue will soon have traffic and pedestrian signals as well. At this time last year, signalization design was still in the works. The completed brick-laid medians and crosswalks, really up the aesthetic appearance for Uptown travelers and residents alike. More enhancements including swanky, cobra-style light fixtures are on their way.